Louvered roofs allow you to make the most of your outdoor space, whatever the weather. The award-winning Outdoor Living Pod™ is a pergola patio canopy with an opening and closing louvered roof. It provides flexible sun shading along with rain and even snow protection to your patio, allowing you use of your terrace - all year round. Featuring a rotating aluminium louvered roof, the Outdoor Living Pod™ is an innovative pergola patio canopy that provides optimum sun protection and ventilation to your terrace. It keeps you cool no matter how intense the sun’s rays. It cuts out glare irrespective of the sun’s angle to provide comfort to the eyes. It blocks damaging UV rays to ensure skin remains safe. When closed, the louvered roof patio canopy is fully waterproof, keeping you dry with effective water evacuation via an invisible guttering system hidden within the framework. Additionally, the louvered roof will withstand up to 75 kg/m2 snow load, allowing the Outdoor Living PodTM to truly be used all year round, irrespective of the weather. Any adjoining internal room also benefits from a reduction in solar heat gain, helping to keep it cool on even the warmest of summer days. Fixtures and furnishings are protected from fading whilst unwanted glare and harsh light is stopped. Added to all this, your view is unobstructed. Optional heavy-duty roll-down sun screen blinds are neatly concealed within the structure cross members*. These lower to provide protection from low level sunlight - and privacy from prying eyes. Additionally, thanks to the clever zip-locking mechanism which holds the fabric within the structure framework, the blinds are rendered windproof, preventing winds of up to Beaufort 6, and acting as an insect screen. Furthermore, clear-view panels can be inserted into the screen material to keep clear, two-way vision. Designed as either a standalone or lean-to pergola shade canopy unit, the Outdoor Living Pod™ is a modular system that can cover terraces of all sizes and can be expanded. Galvanised steel base plates integrated within the vertical uprights (poles) provide an invisible fixing down to the terrace floor, whilst reinforced corners to the legs ensure the structure is both solid and robust. 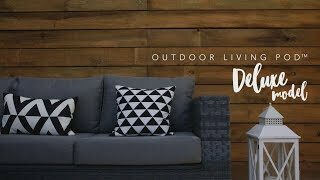 Finished in a stunning textured, corrosion-resistant coating and with small details such as concealed screws, the Outdoor Living Pod™ brings a touch of class to any location. It meets and exceeds even the most discerning requirements and its super-strong aluminium and stainless-steel construction ensures it will withstand even the worst of the British weather. Tested to the severest of quality standards, the louvered roof can withstand wind speeds up to Beaufort 12. Our Outdoor Living Pod™ accessories including low voltage, LED strip lighting contained within the roof louvres, providing ambient evening lighting whilst infra-red radiant heaters mounted to the cross beams keep you warm on even the coldest of nights as they heat people and objects - not the air in-between. The entire solution - roof and any options (integrated screens, LED lighting, infra-red heating) are operated from a stylish radio-controlled wireless handset with LCD screen, so you can easily select which part of the pergola shade canopy you wish to function. Powerful, hardworking - yet virtually silent - motors adjust the roof and optional screens whilst integral radio receivers allow the handset to turn the LED strip lighting and infra-red heating on/off. One product, endless functions: from closed roof to open at the touch of a button, the Outdoor Living PodTM will adapt to your requirements every single day of the week, 365 days a year. No other terrace solution can offer the same flexibility and possibilities as the original louvered roof pergola patio canopy. Discuss your Outdoor Living Pod™ requirements with one of our outdoor living specialists today on 0344 800 1947. They will provide you with expert advice on the perfect configuration and design for your application and requirements. A louvered roof living pod is a fantastic way to bring value to your home, and to create an outdoor living space for your family or business. As a family owned business, our passion is to help you create your dream home. An outdoor living pod is a great way to enjoy the outdoors, in Summer and Winter. We have been working for over 30 years, and in that time we have acquired considerable expertise and knowledge which we want to share with you. Firstly, we are very proud of our Sudbury based Factory and showroom – pop in anytime. Behind the scenes, we have created a design and manufacturing process and that is unmatched. Click here to find out more about our design process and here for more about how we manufacture our products. As experts in Louvered Roofs, we are happy to share our knowledge and experience. We write blogs to provide our users with helpful tips and insights and to help them make the most of their outdoor living pods. One of the main benefits of an outdoor living pod is the value it can bring to your home or business – read about how, and the benefits you can expect, here. Louvered roofs are perfect for all weather, but may need some extra attention in extreme conditions. Read here our tips to stay safe in storms. There are a few different add-ons you can include with your Outdoor Living Pods to give them a little aesthetic boost. Here’s some information about lighting up your evenings in your pods. Finally, there is some conversation about glass walls –while they may look good, they are not at all practical. Here are our thoughts on why and some ideas for alternatives.